Despite a widespread belief that intelligence is inborn, it’s not too hard to imagine we can develop our intellectual abilities. That’s the growth mindset. But does it apply to creative or artistic abilities? Is artistic ability different from all other abilities? Even strongly fixed-mindset people usually agree we can develop certain abilities. Our intellects are so multi-faceted, surely there is something we can grow. But artistic ability feels like a God-given gift. Most artistic people seem to display their talents from a young age—with little effort or training. Doesn’t this mean that the rest of us have some deficit? It turns out you can learn to draw beautifully no matter how old you are. It may come “more naturally” at first to certain people, but drawing is a skill that can be taught. If you don’t believe me, check out a book called Drawing on the Right Side of the Brain, by Betty Edwards. Edwards created a five-day course in portrait drawing for complete amateurs. The results are absolutely incredible. 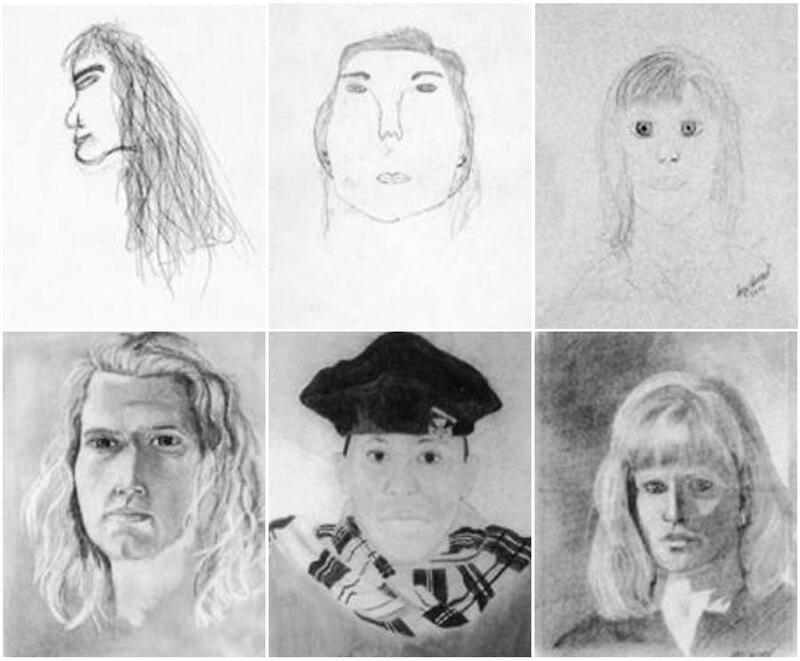 The images below are self-portraits drawn by the students when they first started their course, and then five days later. Edwards says people think drawing is a magical ability because they don’t understand the component skills. Actually, they aren’t drawing skills at all. They’re seeing skills. Drawing can be broken down into the ability to perceive edges, spaces, relationships, light and shadows, and the whole. Some people pick up these skills organically, while others have to learn them and put them together. But as the above self-portraits show, everybody can do it. Why am I telling you this? It’s not because I hope you will go out and become an artist… although that would be wonderful! It’s because so many people have stunted their creative growth because they don’t know one crucial thing. Just because some people can do something with little or no training, it doesn’t mean the rest of us can’t do it with training—sometimes even better. Many people with the fixed mindset think somebody’s early performance tells you all you need to know about their talent and their future. It doesn’t! Can anybody learn to create anything? I’m not sure. But I know Jackson Pollack had almost no artistic talent as a child. It was his enthusiasm and passion which allowed him to find mentorship and eventually stunning originality. And Mozart, contrary to the movie Amadeus, had an incredible work ethic from a young age. And Twyla Tharp, the world-famous dancer, believes so strongly that creativity is learnable that she wrote a book called The Creative Habit. How many more creative geniuses would the world have if people brought their initial abilities—be they ample or meager—to fruition through the habit of dedication? Let’s do a mini version of Betty Edwards’ drawing experiment. Since we don’t have five days, we’ll draw an arbitrary human face instead of a self-portrait. This exercise will take about an hour, but it could change your outlook on your abilities for the rest of your life. Get a sheet of paper, lay it horizontally, and draw a vertical line down the middle so you have a left and right area of the paper. Get a sharp, soft pencil and a good eraser. Now, on the left side, draw either a male or female face using your best artistic skill. Just make it a generic face, not necessarily somebody specific. Try to have the face fill up most of the left area. Take your time, and label it “BEFORE” when you are done. On the right side of the page, redo your portrait using the skills you learned in the lesson. Take your time, but don’t try to make it perfect. Remember the people teaching these lessons have drawn hundreds of faces before and you are just beginning. Notice how much time has elapsed since your first drawing. Did you improve? If you watched the video five more times, and drew five more faces, how would your drawing skills be then? What about if you spent several thousand hours practicing drawing?